Peter matched wits with the Multiplying Menace once before, but this time Rumplestiltskin has changed the equation. With help from his sidekick, the witch Matilda, Rumpelstiltskin is dividing the kingdom into frogs. It's up to Peter and his dog, Zero, to find a solution that will break the Great Divide and bring everything back to normal. --Someone is turning everybody in the kingdom into frogs! Prince Peter discovers it is Rumpelstiltskin and the witch Matilda, who have joined forces for revenge. They want the Great Multiplier, a stick which combined with the Great Divider (which they already have) would give them unlimited power! Can Peter outsmart them with the wisdom of math?--Doc Kirby's "On the Bookshelf"
A CBC Featured Book! 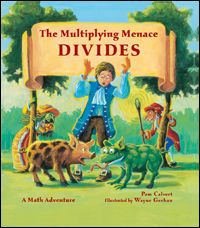 - I'm so honored the Children's Book Council featured Multiplying Menace Divides on their reading list! A Scholastic Reading Counts Selection! - Scholastic Reading Counts is providing a quiz for this book. Hooray!